My #teamteach #teambcsd colleagues just completed their second-week of EdTech trainings at our district Summer Institute. Teachers throughout our district attended subject area keynotes in the morning and choose from an array of breakouts in the afternoon. These workshops included reading strategies, mindfulness, clotheslines math, and, of course, technology to accelerate learning. While my colleagues were hard at work, I was on a very nice family vacation that ended on Wednesday. On Thursday and Friday, I joined my colleagues. We gave two breakouts in three different on a daily basis. Two of those presentations were on Google Slides. One was Graphic Design in Google Slides, where the @InspiringMrsK took the lead. The other was TK-3 Beginning Google Slides that I presented with @TeachTechMath. In one presentation, my son’s former 4th-grade teacher was excited to apply the color combinations activity to her wardrobe. We had a good laugh over that comment. The ability to apply new information to new areas demonstrates quality learning. In the Tk-3 Google Slides presentation, a school site administrator requested workshops for organizing her photos. I took a short break from presenting to demonstrate how to upload photos to her school Google Photos account and create an album. Today, I am updating that page to make sure that the directions are clear. Next week is our last week of Summer Institute trainings and I plan to approach our district administrators to see if we can schedule a series of workshops at the beginning of the school year. Our district highly encourages our school sites to create their yearbooks using whatever tool they wish to lower the cost of yearbooks for our families. To avoid a huge rush in February and March, school sites want to start organizing their photos now! 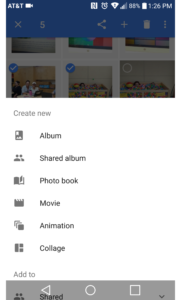 A series of workshops will help teachers, students, and parents get started taking photos, sharing those photos, organizing those Google Photo Albums with Google Sheets, and writing captions as a class activity. Yes, it is possible to follow directions on a free website, but many times face-to-face workshops make the process that much easier. Wish me luck!